I take it, you all have figured out by now that I can be a bit of a save the environment nutter! So here is my appeal to you to not kick your old withered looking teak wood garden chair into the land fill and make it grow even bigger! Rather, spruce it up! And if I can´t make you see the impact on the environment let me show you the economical impact it will have on your wallet! Divided by two hours of work it comes to 68,05€ per hour of work that you safe. Now there are not many people that make that hourly rate at work AFTER tax has been deducted (and in some countries pension and state health insurance). So here is the big question: How many hours do you have to spend at your day job to pay for one chair? Would you rather go work this many hours in your day job to be able to buy a new chair? 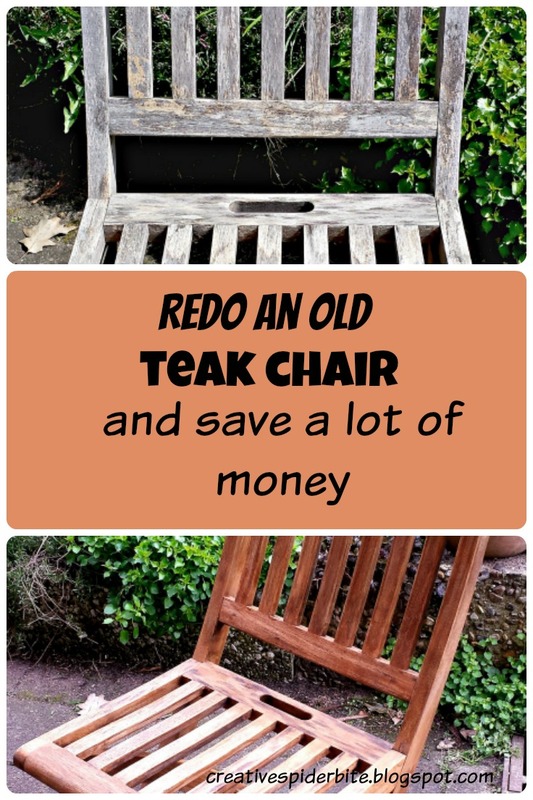 Or invest roughly 2hours of your spare time and have an old chair look like new and safe the environment? If you still say you want to shop for new ones, than please don´t trow your old ones on your local landfill mountain, but either put them on craigslist or your countries equivalent. Or donate them to good will, cancer research shops or red cross shops. You´ll be doing a double good deed, not just make someone else happy but safe the nature! First you brush it off with a steel brush. Get all the moss, dirt, bird poo and other grossnesses off. Next step get a small bucket of water and a sponge. I reuse mine! I always throw them into the hot wash after a few days, and once they reach the end of life time, after what feels like a gazillion of washes, I use them for projects like this. Start scrubbing off the grey layer on the teak wood. It comes off fairly easy. The water gets filthy pretty fast, therefor you will need to change it several times. 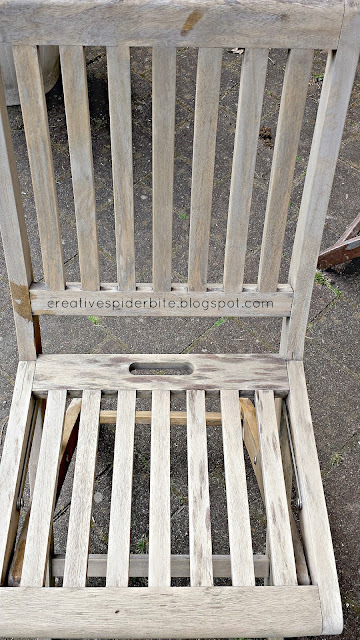 I don't add soap to the water as it will dry the wood even more and the grey layer came off just fine without. There is no need to stress the wood even more. 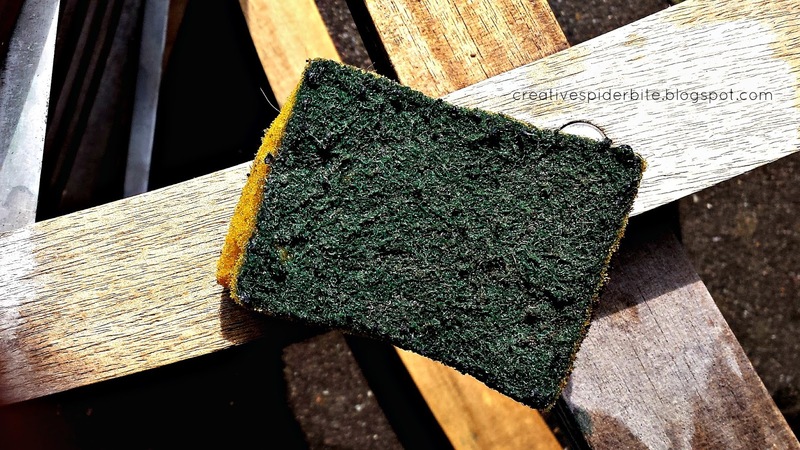 This is what those sponges look like after a gazillion of washer cycles! Don´t throw them out, reuse them! Safe money and the environment! 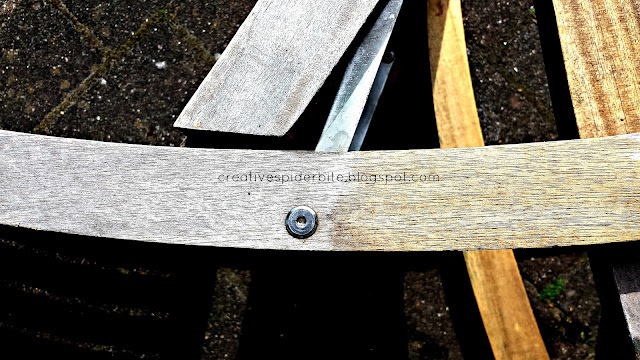 grey goo needs to be wiped off with a soft cloth before applying the teak oil. 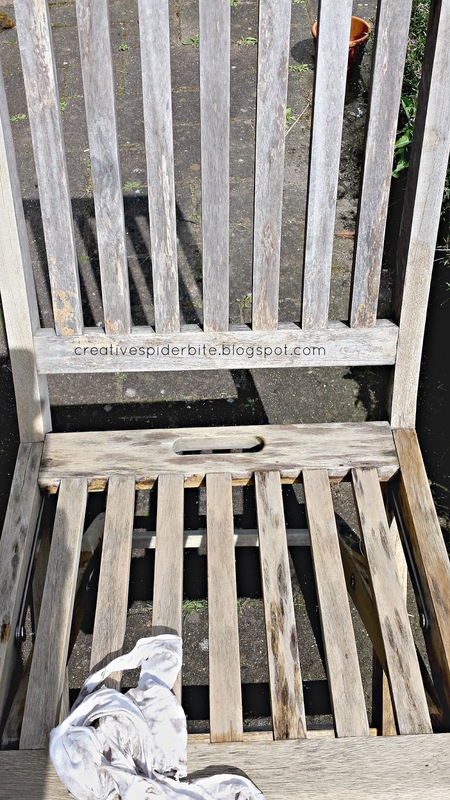 now let the chair dry thoroughly in the sun. Fully cleaned and nearly dry chair. Once it is dry get gloved up and another sponge and start applying the teak oil. 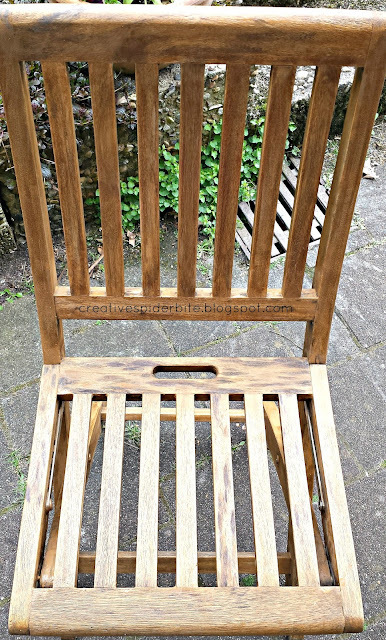 Read your teak oils instructions, mine could get a second layer after only 10 minutes. So by the time I finished the chair I could start again at the top as the 10 minutes had passed already. Most teak wood furnitures should be happy after 2 layers. 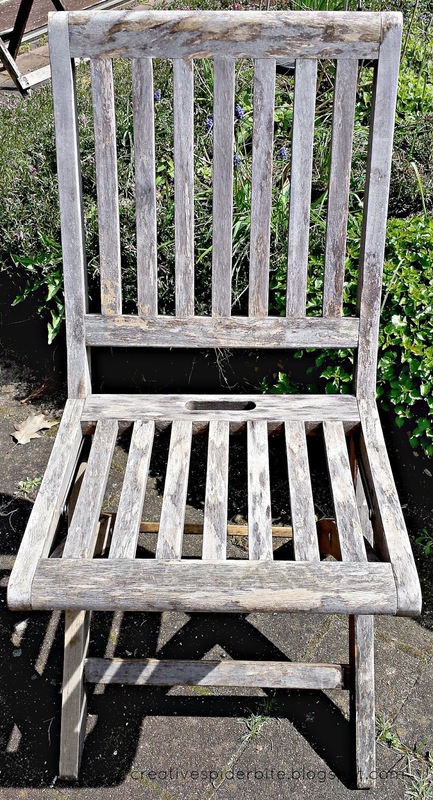 But this chair hadn't seen any love in 16 years so I gave it a third layer. After 10 minutes I wiped off all excess oil that hadn't been soaked up. This is an important step as it will leave staines if you don't do it or leave it too late. Now doesn't it look like new? Wasn't´t it well worth the time? Now stow it away safely to let it dry for 48 hours and after that you can park your derrière on it again and enjoy a cuppa coffee. 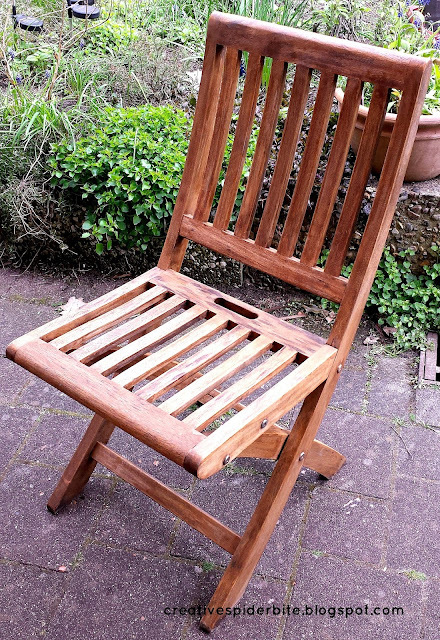 BTW teak oil is not made from teak wood, it is just a product made to preserve the wood! It usually contains linseed oil and can be used to preserve other woods, too! Wich will be one of my next projects! You can find out more about teak wood and teak oil here. You had us at "bird poo" and "grey goo". The chair looks fantastic!! well done! I am really liking the finished product. Do you add a cushion to the seat, or do you leave it as is? I am making cushions at the moment from used Coffee bean canvas sacks that would probably go really well with the chair. Good thinking thanks for the inspiration, Mary! Thank you Rhonda. I feel humbled! I looked up the linkup and bookmarked it! Nice project! The chair looks great. We have a pine "Jack and Jill" seat that is starting to look a bit weathered - I know it needs some time and elbow grease - I like your calculations to justify putting in the work! Wow, I am very chuffed! Thanks for the chance to participate!